She loved it !! We were pleased!!! But it started disintegrating while Elaine was wearing it yesterday !!! Is this some kind of a joke, she asked !!! perfect ! … Elaine would like it .. and she does !! 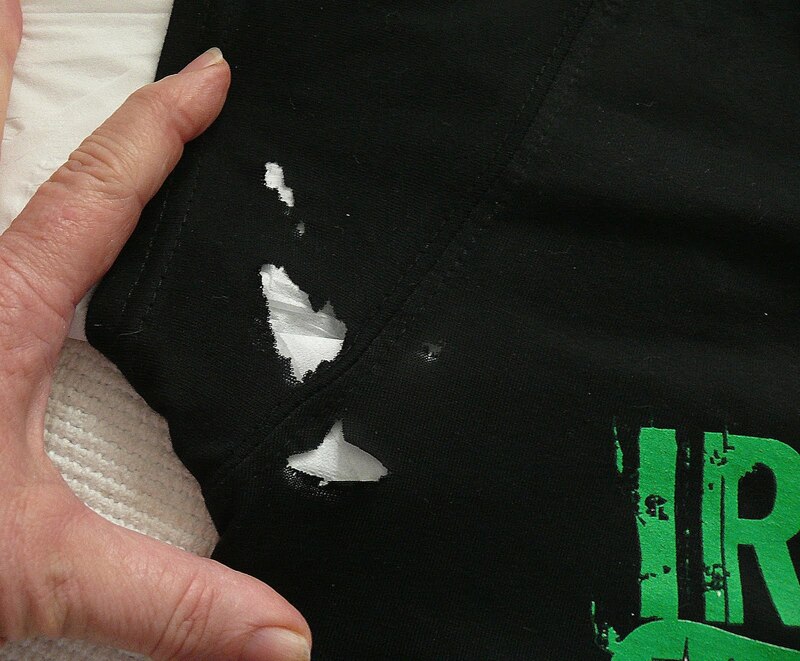 But she put it on the first time yesterday and within an hour or so I noticed a hole under her arm … how could I have missed THAT ! It looked easy to stitch together .. under the arm .. no-one will see it … a little while later I noticed more holes .. and more !!! Now .. I can’t ‘pop over’ to the shop and exchange it !!! Bryan suggested I write them an email with a photo attached … not that it will do anything, but just to let them know that they sell ‘disintegrating’ T’shirts ! … hence the photos ! It obviously has something to do with her deodorant and the fabric – she uses Dove aerosol deodorant – as I do. The fabric has a good quality feel… ! Never seen anything like this before !! Carl and Lance – be warned ! 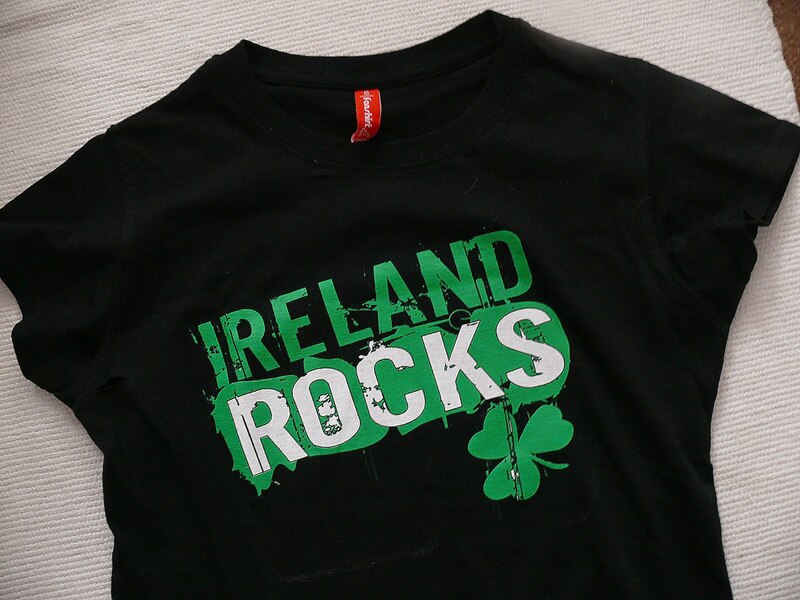 You may also have disintegrating T’shirts from Ireland ! Oh that's just freaky!! 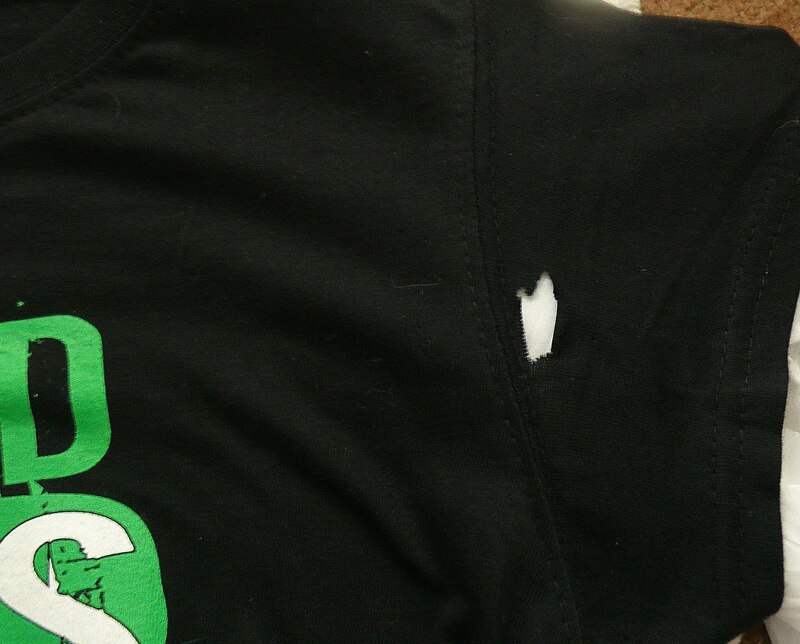 You should link your post to the shop in Ireland ;)Lance's shirt is perfect, not holey at all! Aaaah! That's very sad! And it's such a cool shirt too. NOOOOOOOOOOOOOO thats awful…I cant believe it happened so quickly as you would have noticed those holes back in Ireland…they huge! !So sad. Oh nooo thats terrible!!!! Cool T/shirt though. I am sorry, but I just laughed out loud imagining her walking in town somewhere and suddenly having her whole shirt fall apart around her. Never heard of that! Horrible!